"The Introduction. Steve Jobs at Macworld. 12"x 12" x 1.5" original oil painting by Nitrozac. This painting was sold, congrats to the winner! Click here to view the auction! I am pleased to introduce to you today my latest painting. 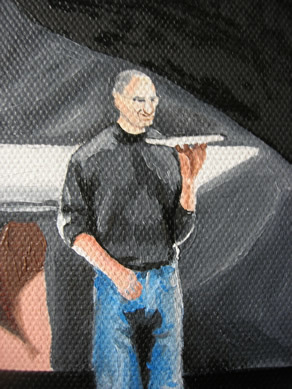 It depicts Steve Jobs, at the moment the MacBook Air was unveiled at Macworld. He is on stage in front of an adoring crowd, while behind him a huge monitor projects his image to those in the back of the room, and those watching around the world. In the foreground, two audience members are recording the moment with their digital cameras. That will be their proof that they were there, that they were one of the privileged to witness this introduction. Being in the audience at a Steve Jobs keynotes is an electrifying experience. The room is filled with an energy unlike any situation in the world. It can be crazy! There is hushed anticipation, squeals of delight, laughter, and everyone is always mesmerized by Steve Jobs presentation. People are blogging, twittering, texting, filming, sitting with mouths agape, clapping in geek glee... it's a cultural phenomenon. 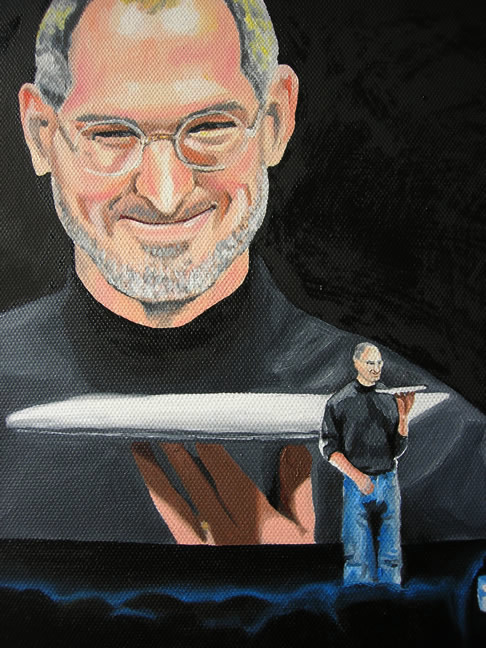 For me this painting is a timeless study of that moment and of the remarkable Steve Jobs. It's more than just the unveiling of a product. It's captures the man's amazing ability to inspire desire in us, and his intense pride over his new creation. It's as if he is showing off his new child to the world, and he is beaming with the pride and love that only a new parent has. He invites us to share his pride and love by owning the new object. It's powerful, and infectious, and if you have ever held a product like this in your hands, a Macbook Air or an iPhone, you feel these emotions, a result of Apple's exceptional engineering and artistry. 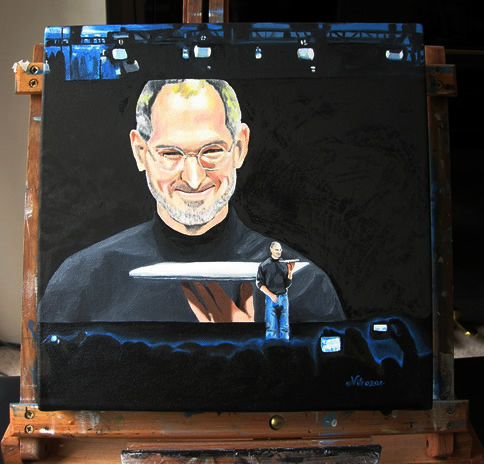 There is a wonderful duality happening in the painting, with Steve's image on the large viewscreen, and his real life figure standing on the stage. I like how the viewscreen image seems more real, has more detail, and seems so lifelike, while the lone figure on the stage is more of a sketch. For most us, our heroes are like this, they are larger-than-life figures on our televisions and computer screens that we feel we know so well. In actuality, the real person, the one behind the public persona, remains private. But there is still another reflection in the painting; the lights of the personal recorders. They are more glow than detail, more memory than digital copy. This is where your experience lives, where your memories of that moment reside. It is reminder that in an age of wide screens, high-definitions, and perfect angles, we still find the need to capture and share our own unique perspective. I know you will love this painting as much as I do. In the future, you will look at this work and think back to these times, and remember them as remarkable and cherished moments in tech history. Details: "The Introduction. 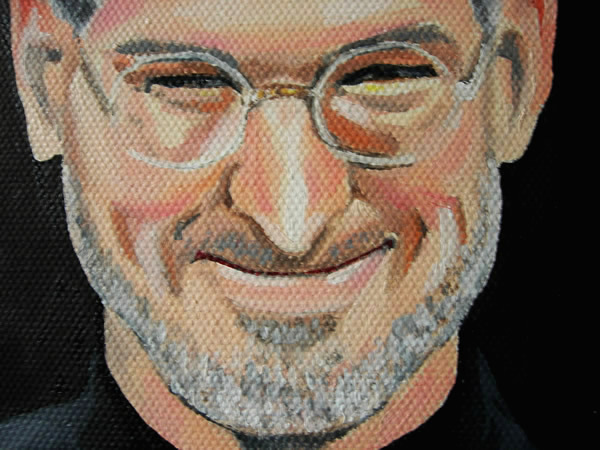 Steve Jobs at Macworld." is Nitrozac's 39th painting of her Painting Blog. It's an original oil painting, on 12 x 12 inch stretched canvas. The painting is 1.5 inches thick, with painted sides, so you can frame it if you wish, or display it as is. The painting will be dry and ready to ship a few weeks after the auction ends, depending on the drying conditions and such. The back of the painting will contain the title, the date painted, Nitrozac's signature, and a fingerprint for authenticity. Please note that the photographs capture parts of the painting that are still wet. This is especially noticeable on the right hand side of the painting, in the black paint, but this will disappear as the oil paint dries. The painting should be able to ship in about three weeks. Rest assured, I will not ship an oil painting that hasn't fully dried! If the painting isn't sold at auction, it will be up for sale in our webstore at a higher than originally listed price, so it does pays to bid on the auction! Best of luck to all bidders, I know you will love this painting as much as I do. Shipping for each painting is extra... to the US and Canada it is 15 dollars, to other locations, 25 dollars. If the buyer is located in Canada, I will have to charge the appropriate Canadian taxes.